The site now has some photos of the MSL rover at Moon Day 2012. Click here for the gallery. This is a (very delayed) set of minutes from our last meeting. We had seven people show up to our last meeting before Moon Day, and Tom put on a real show that once again got the kitchen help talking! Tom brought 4 giant mats that, when put together, made a complete, giant sized map of Mars that we can lay out on the floor and actually drive our rover over. The Rover was also in good shape, in the almost final shape we would see it on Moon Day, and it really looks like the MSL (Tom really did an incredible job!). Dan and Mark also showcased their (at the time of the meeting) still under construction Mars crater to add to the Mars map that Tom made. The crater is about 4 – 5 feet in diameter, in two pieces for breakdown to travel, and a realistic 3-D challenge for our Moon Day Mars Rover drivers. As we say yesterday, this all came together beautifully, and we had not only a great rover, but the only ‘environment’ for a rover to immerse itself into to driver around in. Kurt and Kris gave a rundown on our activities at the University Rover Competition (URC), and gave a slideshow of pictures we took there. It was a great event, and we are looking forward to staying connected and helping URC 2013 be even bigger and better than before! Kris also discussed the considerable progress she has made on formatting the scientific papers submitted from past conferences – with the trial software she found formatting was much easier than word and the sample results were very professional. Kris has since been asked to help out with formatting the conference program, but we look forward to picking up the paper publishing task again after the conference. We discussed our preparations for the national convention, and we settled on the T-shirt design, with Mark’s beautiful MSL artwork, and, given the larger audience (we are expecting over 200 at this year’s convention) and nearby planetary society, we are leaning forward and ordering 60 t-shirts this year, instead of the 40 we ordered last year. The final plans for our Moon Day table we finalized, which i will describe in a separate e-mail detailing our very successful Moon Day activities! Yes, time for another meeting, this Sunday, 6:30 PM, Spaghetti Warehouse, Plano, TX off of Rt 75 at the 15th street exit. 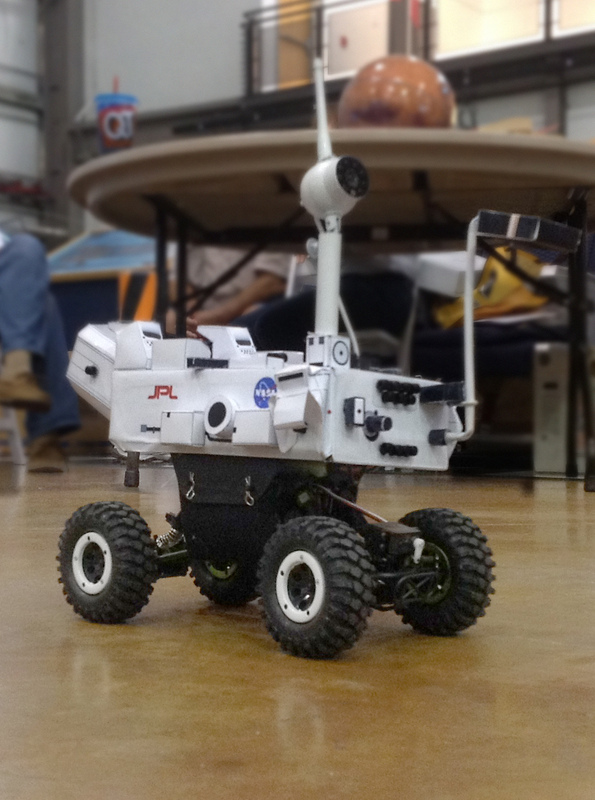 Mark and Tom have been working on getting a rover and camera for moon day, and we will have a demo this Sunday. (Dan: please if you don’t mind to bring your monitor to see if it will work with the camera). Plans are coming together for a great presence at this year’s Moon Day! And I hope to hear the latest regarding T-shirt designs, and any progress on our e-publishing efforts. Kris and I are counting down to going to MDRS to help with the URC, and expect to have much to talk about when we return for our June meeting. Note that our June meeting will be the LAST meeting before Moon day!! Time flies! Registration for the conventing is open, and we should have a great line up of speakers in JPL’s backyard. MSL continues its flawless journey to the Red planet, so let’s hope it keeps up for the nail biting entry descent and landing this August! And, of course, SpaceX did it!!! They launched Tuesday morning and are on their way to a hoped for (and i expect they will do it) docking with the Space Station Friday. This is a very big moment for commercial space, space exploration, and our hopes for moving forward in space exploration.